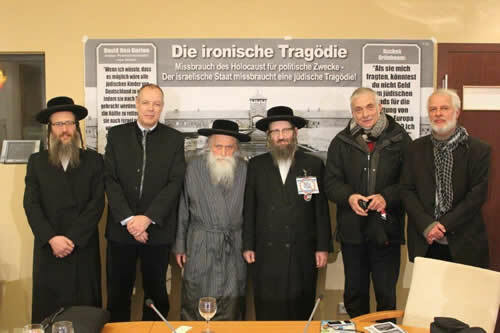 Orthodox Rabbis, holocaust survivors and descendents of survivors, held a press conference in Berlin yesterday in response to a memorial ceremony, held at Auschwitz by 69 Israeli politicians, who warned of rising anti-Semitism in Europe. The Rabbis found it repugnant that the State of Israel, whose founders refused to rescue Jews while the Holocaust was happening, should be commemorating the Holocaust. "We survived by hiding in a bunker in Budapest during the Holocaust," said Rabbi Moshe Dov Beck, 79. "It is well known that the Zionist policy during the Holocaust was that only Jewish bloodshed on a massive scale could help them achieve their state after the war, as a gift from the guilt ridden and sympathetic victors. They provoked anti-Semitism and sabotaged rescue efforts, all for their political goal." 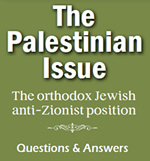 "As for today's anti-Semitism, the Israelis complaining is duplicitous, because the existence of the Israeli State and it's atrocities is largely the cause. 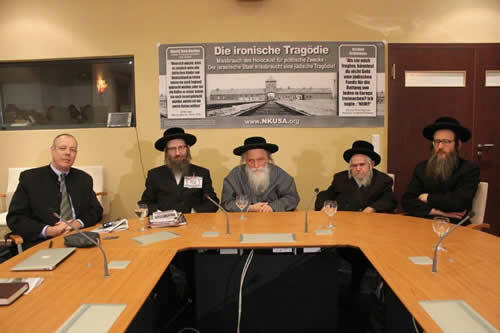 And of course it is obvious, that they reap the benefits – more world anti-Semitism, more Jews immigrate to their state", said Rabbi Dovid Feldman. "The Zionists want the world to believe that they represent world Jewry and Judaism, that is false," said Rabbi Yisroel Dovid Weiss. "They accuse everyone who criticizes their vile actions of anti-Semitism, that is also a lie. Unfortunately there are those who hate all Jews because they consider Judaism and Zionism one and the same. Thus Zionists bring danger upon Jews and then they present themselves as the saviors of the Jewish people." "The Torah teaches that Jews are in exile by a Devine decree. Jews are required to respect the nations amongst whom they live. The Torah forbids Jews to have their own state. Jews accept the Almighty's decree and wait patiently for His redemption, without any human intervention. It goes without saying that Jews are forbidden to steal land, kill or expel anyone. Precisely because we experienced the Holocaust, we must learn tolerance and respect for others - not use our suffering as an excuse to oppress others." 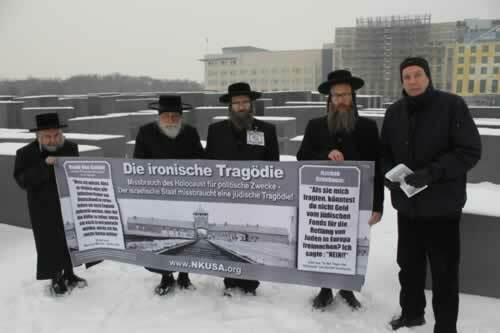 "Subsequently, this Zionist ceremony is nothing less than a brutal affront to the memory of those who perished in the Holocaust."